A Rudraksha bead is distinguished by its number of ‘mukhi’ or faces. Hindu Religious texts talk about Rudrakshas with one to fourteen faces. Some texts refer of Rudrakshas with one to twenty-one faces and some talk about Rudrakshas with more than thirty faces. The five-faced Rudraksha bead is the most common one. Four- and six-faced beads also occur commonly. The natural appearance of some Rudraksha faces is very rare and due to this rare appearance they have become part of Hindu myths. The two-faced Rudraksha – which looks like two semi-circular bead joined – is called Gowri-Shankara or Shiva-Parvati or Ardhanarisvara and falls in the rare category. 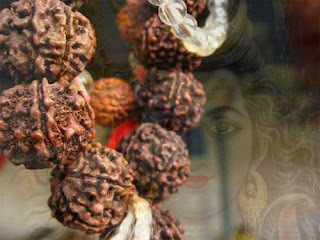 The three-faced bead named after the Trimurtis is another Rudraksha in the rare category. The rarest of all Rudraksha beads is the single-faced or ek-mukhi. It represents Brahman or Supreme Truth. 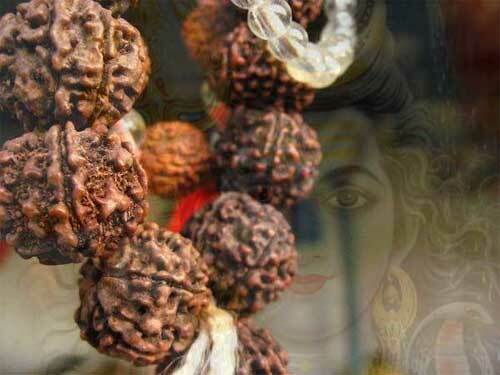 Legend has it that single-faced Rudrakshas are produced in sets of three. One disappears, one goes underground and one remains on earth. There are two single-faced in the famous Pashupatinath Temple in Nepal. Devotees are allowed to view the bead during auspicious days. The different attributes of the Rudraksha faces are mentioned in the Rudraksha Jabalopanishad.